After 18 months and some 100 000 hours of labour, François Gabart’s giant trimaran finally emerged from the dockyard to take it’s place on the water. The Macif-sponsored project is – well – just massive. It was a nervous moment for Gabart and his technical team. The 2013 Vendee Globe and 2014 Route du Rhum winner eagerly watched on as the giant multihull was carefully placed in the waters of the submarine base of Lorient, France. It was the first of numerous ambitious challenges ahead for Gabart and the 30 metre, 14.5 ton trimaran. 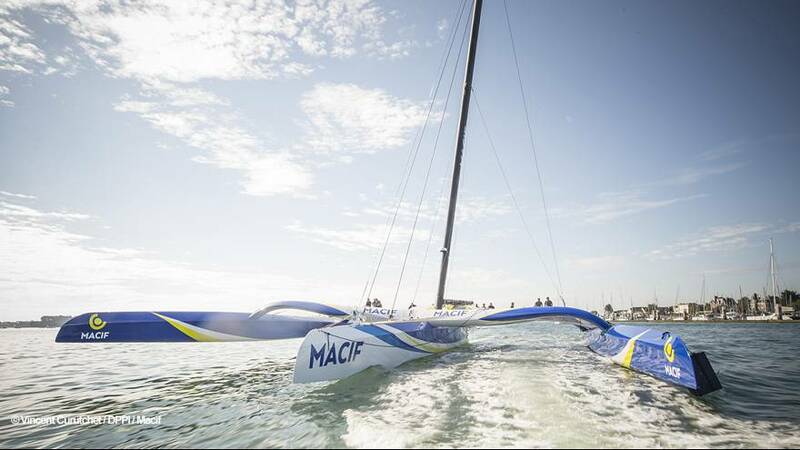 The 32-year-old French skipper will first officially test the waters in the Transat Jacques Vabre in late October with co-skipper Pascal Bidégorry. In 2016 Gabart will attempt to smash a series of solo records notably across the Atlantic and Mediteranean. All of that will lead Gabart to his ultimate goal with this 21 metre wide monster trimaran – an attempt to beat the world record of solo circumnavigating the globe in 2017.